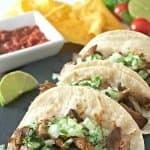 The easiest recipe for pork carnitas ever! Tender and flavorful pieces of crispy pork that just melt in your mouth. So easy and effortless, you can celebrate Taco Tuesday any day of the week. Cut the pork into large 4 inch pieces and place them in the bottom of a slow cooker/crock pot. In a small bowl, mix together the chili powder, oregano, cumin, salt, and pepper. Sprinkle mixture over the pork pieces and add the minced garlic. Using a spoon or hands, coat the pork with the spices and the garlic . Pour the beer and lime juice all over the seasoned pork. Cover and cook on high for 4 hours or low for 6 hours. Preheat the oven broiler. Remove the cooked pork pieces from the slow cooker and place on a large baking sheet (can cover with foil to make clean up easy!). Using two forks, gently pull apart or shred the large pork pieces and spread out across the baking sheet. Place under the preheated broiler until pork turns crispy on one side. Remove and serve immediately. To serve: stack 1 or 2 warmed corn tortillas on top of each other, fill with the desired amount of shredded pork and top with favorite accompaniments.